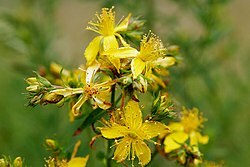 'S e Eala bhuidhe, lus-Chaluim-Chille, Achlaisean Chaluim Chille, allas Chaluim Chille (hypericum perforatum) lus a tha air cleachdadh ann an leigheas tràidiseanta an aghaidh an dubh-leannachd. Is e lus Clann MhicFhionghain e.
Mac'IlleMhaoil, Alasdair. 'Sean Eolas-Luibh (13) Eala-bhuidhe' ann an Gairm Àir. 33. Am Foghar 1960, d.71. Air a tharraing à "https://gd.wikipedia.org/w/index.php?title=Eala_bhuidhe&oldid=523999"
Chaidh an duilleag seo a dheasachadh 25 dhen t-Samhain 2016 aig 15:12 turas mu dheireadh.